Argus Group Holdings Limited announced a net profit of $8.2 million for the six months ended September 30, 2016, compared to a net profit of $3.0 million for the corresponding period in 2015. 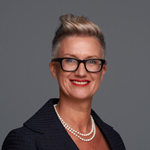 Alison Hill [pictured], Chief Executive Officer of the Argus Group, comments: “The Argus Group’s brand promise of “Our Interest Is You” underpins how we do business. “Argus has taken steps to reduce income volatility within our investment portfolio. The changes made have resulted in investment income for the six months to September 30, 2016 of $14.0 million. “During the year, shifts in both equity and bond markets have resulted in unrealised gains of $7.9 million where last year, market movements generated unrealised losses of $11.8 million. “Additionally, the Group reduced its holdings in Bermuda equities by 35 percent, in keeping with the strategy to reduce concentration risk within the investment portfolio. The sale of Bermuda equities had a one-off positive impact of $3.1 million on the financial results for the six months to September 30, 2016. “The Group experienced an increase in Net Benefits and Claims of $7.5 million primarily due to health claims returning to a more normal level after the unusually low claims incurred in the six months of the prior year. “This coupled with the decrease in net premiums earned of $2.4 million has resulted in the combined operating ratio, which is a measure of the underwriting performance for our general and health insurance business, of 89.5 percent compared with 82.8 percent in the prior year. “This trend validates our commitment to support a sustainable healthcare system in Bermuda through our Population Health and Thrive. wellness initiatives. On the Consolidated Balance Sheet, Total Assets including Segregated Fund Assets stand at $2.2 billion. Shareholders’ equity attributable to shareholders of the company has increased to $133.1 million, substantially in excess of the statutory capital required to conduct the Group’s insurance and financial services businesses by the regulatory bodies to whom the Argus Group reports. The Board has declared a dividend of nine cents per share payable on January 24, 2017 for shareholders of record on January 10, 2017. This represents a final dividend of 18 cents per share based upon the audited financial statements of the Group for the year ended March 31, 2016.